Many of you won’t know this, but every Christmas day Planet Ice offer a free skate to give families something different to do on Christmas day rather than eat, open presents, be merry and sleep. Well this year we decided to do something different and raise money for those of us less fortunate at that time of year. Even though this was the first year the public donated to skate on Christmas day we saw our largest number of attendances through the doors. We managed to raise £1484.00 to be able to support our local charity, Willen Hospice, who work tirelessly to help those people who need it the most. We chose this charity because Willen Hospice is a charity which provides specialist care to patients and support for their families. Their vision is to be the lasting and thriving provider of free care to all people affected by life limiting illness in our community. 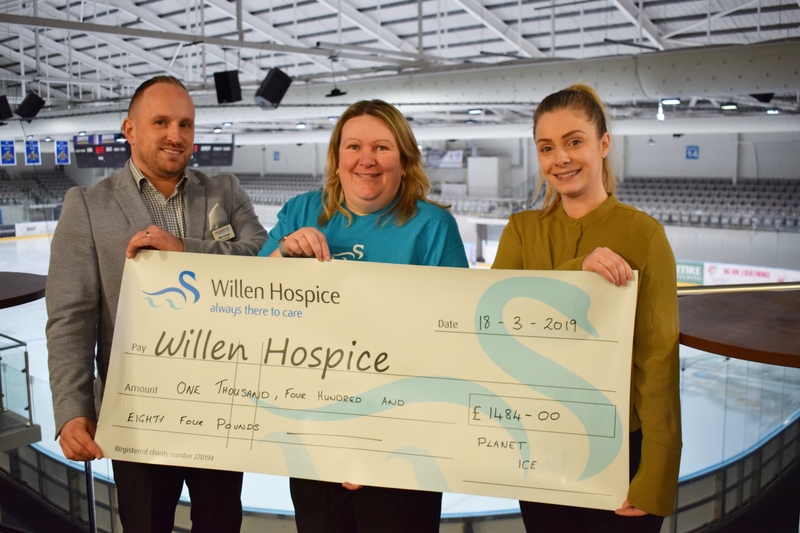 Mark Savage and Belinda Bassett, Planet Ice MK General Managers, stated ‘We are very pleased with the amount that we have raised for Willen Hospice. To work with our local community to support a local charity is rewarding and we look forward to working with Willen Hospice in the very near future. Working with the community, and getting such great results, proves that we can all work but together we win’.